Mexico’s leading presidential candidate Enrique Peña Nieto talks about his plans for the nation’s future. Mexico’s leading presidential candidate explains how he’ll stop the violence and challenge the cartels. Photograph by Amanda Gordon/Bloomberg via Getty Images. What will you do about violence if you become president? 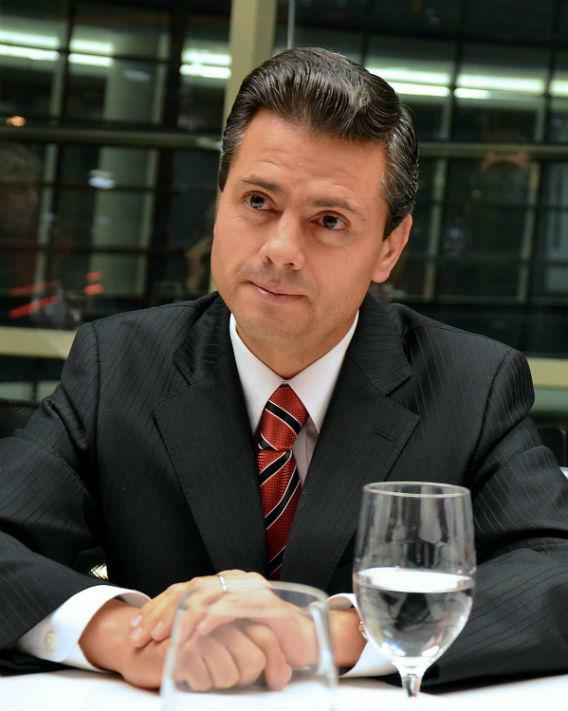 Enrique Peña Nieto: My commitment is first to reduce violence. We need to take care of three main crimes: homicide, kidnapping, and extortion. That doesn’t mean not paying attention to other crimes. But the name of the game is to reduce violence. First of all, to have the state, municipal and federal governments, sharing the strategy. Instead of the governors acting independently from the president as they were under President Felipe Calderon? I feel what the government did until now, which was not wrong, was to take a decision to fight the criminal organizations … I have announced publicly that it was a good decision that has nothing to do with what party is in charge in government. It is an obligation of the state which is beyond politics. What can be discussed is the strategy he followed. The strategy was not, in my opinion, the correct one. [Calderon’s decided:] Let’s go get the crime organizations. For us, the main priority would be to reduce violence. Up to now, there seems to have been a competition between the federal and state governments. Each has been acting independently. The federal government has not shown much collaboration with the states and investment was made mainly in the federal police forces. Not much has been put into the state governments. Would you keep building up the federal police as Calderon has? I have committed to keep and enlarge the federal police. But at the same time, the state police needs more investment. We also need to professionalize our police forces. You would continue to fight the cartels? Of course. Any criminal organization involved in drugs, the trafficking of people—the state has the obligation to fight them. Do you believe you can succeed the way President [lvaro] Uribe did in Colombia? I am sure we can succeed. It is very easy to measure if the strategy is giving results or not. Just look at the numbers. In 2006, we had less than half the murder rate of today. The murder rate in 2006 was 10 per 100,000 people. Now we have 23 murders for every 100,000 people. It shows that the strategy has not worked well. Aren’t the police very corrupt? We need to evaluate through polygraphs and examinations the level of corruption. We need to make the state police a unified force. … Now we have three levels of police forces: the federal, the state, and the municipal. I would put municipal and state together to have one unified police force. But you have to do something about corruption? Yes, that is something you need to work on all the time. So your priorities are … ? What we hear now from the government is why things are not happening. What we need to say is that things have changed and happened. We hear excuses, blaming the state governments—this is not the way to fight crime. The key to achieving these changes is to open opportunities to the people. A lesson from U.S. politics is this expression of [Bill] Clinton: “It’s the economy, stupid.” We need to have a change in the condition of our people. We have not opened enough. … That is, for me, the key—to grow, to open up job opportunities to the people. How can you do that unless you break up monopolies? I will do this. I promise. … It will happen for sure. This will be the first big step in creating competition. Your party did not break up monopolies before, when it was in power. They made an effort, they tried. Now the conditions are different. Now the PRI has a very important backing from society to push the reforms that have to be made to put Mexico into a growing path. Your party has the power to do that? Our party has the fuerza politica—the capacity to negotiate and build agreements in order to push the reforms. The party on the right, the PAN, tried to do it and they showed they couldn’t. The left is in opposition to the reforms–the PRD. That is said clearly by their candidate. He has said he will not go for the structural reforms because he believes they are an imposition by the powerful countries. Your party, the PRI, has been accused of always having an accomodationist strategy with the cartels: Live and let live. We as a party have been accused of that, but they have never proved it because it never occurred. But long before you came along in the ‘70s and ‘80s, there were cartels and a PRI and an accomodationist strategy. When the PRI ruled, those governments were in a constant fight with the crime organizations. It is amazing that PAN is usually saying that when the PRI comes back there will be new agreements. That cannot happen because I just said it here: The state has the obligation to lead the fight against the crime organizations. Do you remember El Chapo [Joaquín Archivaldo Guzmán Loera], the biggest drug lord in Mexico? The PRI put him in jail. When the PRI left government, he was in jail. With the PAN government, he escaped. He is now on the list of the most-wanted men. The PAN gave a lot of power to the governors, whereas the PRI presidents had total power. Will you be the government of creating jobs? I will be the government of increasing economic growth and creating jobs. Take it from me that that’s the main issue. Does that mean you will open up Pemex [the state petroleum company] for foreign investment? I believe that Pemex as it is today will not be efficient enough to build all the infrastructure and use new technology that can help this Mexican company to be more productive. We need to be more productive in Pemex, and I see a chance to make the reform that can allow the private sector to invest in exploration and refineries. Let me be clear: That doesn’t mean to privatize. I believe the state needs to control hydrocarbons. You believe that if you get private investment in Pemex, that will increase the output of Pemex and therefore provide more money for the state? Yes, exactly. The thing is to have more investment in order to be more productive. In 2005, at the top of production, we had 3.4 million of barrels of oil a day and now we have 1 million less. We need to reactivate the capacity of Pemex. What about the relationship with the United States? I see a great chance and opportunity to build a very close relationship with the United States for many issues. But I would work on the opportunity of going forward as two governments, starting almost at the same time. For me, what would be something to explore is to go further on what seems to be only commercial relations. To make closer integration of the NAFTA participants, to make a more productive region in the world (U.S., Mexico and Canada), why not make another agreement - we already have one on free trade. Now in the world you have regional blocs—Europe and Asia. Are we going to compete by ourselves or do we want to do this together? Do you think you can tackle the oligarchs and open up competition? Yes, I will. The government I want to lead, I want it to be distinguished by promotion of competition. The actions that we take must keep the macroeconomic stability we have now. Secondly, we will work hard every day on making more competition in Mexico in all sectors. Then, we need to give regulatory institutions more power to fight the monopolies. We need to have special trials to respond and to resolve differences between competitors accused of having monopolistic practices. Third, we need to make energy reform. On the other side, we need to allow private participation in new energy sources, like solar and wind. Fourth, [we need] more credit. What would you do about poverty? Something that cannot be forgotten in discussing Calderon’s past six years is that poverty has been increased by 12 million people. We have almost 60 million people in poverty. It is time to make a revolution before the revolution reaches us. There are many commitments I have made for reducing poverty. One is to reform social security. Social security reaches only 44 percent of Mexicans. One of my goals is to give social security to all the people. Does that mean increasing taxes? No, collecting more taxes. We need to enlarge the taxpayer base. Maybe make the federal and state co-responsible. Ninety percent of taxes collected are at the federal level. I expect my opponents will be more critical. They are attacking me all the time. But … I believe the first of July I will become president.